This high-performance digital audio switch/converter decodes the digital optical audio sources into analog stereo sound for the existing A/V receivers, amplifiers, mixers or recording deck that do not have digital inputs. It is a premium digital to analog audio converter with 3 digital optical audio inputs. In addition, this converter could be deemed as an optical audio switcher with 3 optical audio inputs. Need to add new or more digital audio devices to the existing amplifier or AV receiver. do not want to spend more for upgrading existing stereo system for the new digital audio equipments. This audio gadget helps users decode the optical audio from blur-ray player, set top box or game console into analog stereo sound for the existing A/V receivers, stereo amplifiers, head phones, power speakers or recording decks. This digital audio converter/switcher provides 3 types of digital/analog audio outputs, 1 of RCA stereo L/R output, 1 of stereo headphone style 3.5mm output and 1 of optical audio output/pass-through. It provides reliable and accurate digital audio transmission with no loss. All digital and analog stereo outputs are available at the same time with real time passage. This optical audio switch/converter has a 24-bit audio DSP with 96 KHz digital receiver built in. It can support all S/PDIF standards including compressed multi-channel DD 5.1, Dolby Digital, AC-3, DTS, THX, HDCD as well as uncompressed LPCM/PCM audio formats. This compact optical audio switcher helps expand your existing receiver or amplifier with new or additional digital audio inputs. Switching input is very easy by using the push button on the front panel of the switch. No more disconnecting and reconnecting audio cables when you need to change input. Multiple digital audio source equipments such as blu-ray player, DVD player, cable box, game console can share the same amplifier, receiver, home theater system or loud speakers. 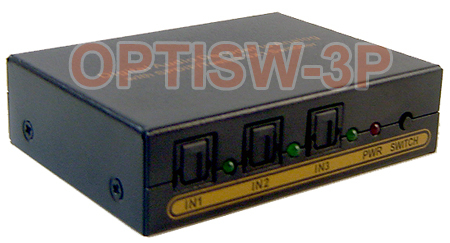 This digital optical audio switch/converter also prevents the wear and tear on the input/output jacksof the input sources and receiving device from repeatedly disconnecting/reconnecting them. This 3x1 digital audio switch converter will memorize users' selection of audio input channel again after the power off. Digital to analog audio converter with 3 digital optical audio inputs. Premium optical audio switcher with 3 digital optical audio inputs. The selected digital audio input channel can be decoded into 2-channel stereo sound with rich and vibrant sound for older AV receiver, preamp or amplifier. Fast audio switching between 3 digital input channels through the push buttons on the front panel with LED indicators. Advanced 24-bit DSP and 96KHZ/24-bit DAC built in. Easy way of expanding or adding new digital audio inputs for existing home theater receivers and amplifiers. High-resolution digital to analog audio converter with superior audio dynamic performance for consumer audio and musical applications. Real-time audio output with original digital audio input information retained at sonic depth. Supports all S/PDIF digital audio formats including AC3, Dolby Digital, DD 5.1, DTS, THX, HDCD and LPCM/PCM audio formats. Built-in last memory function. This audio switch will memorize users' selection of audio input channel again after the power off.